BATTER UP! Cupcakes are great. Fluffy, moist, sweet, and full of sugary goodness. Did you know, that according to mobile-quisine.com, the world record cupcake eater ate a total of 29 cupcakes in 30 seconds? That’s quite impressive! Mrs. Joseph’s Intro to Human Services Class had a friendly competition throughout the week. 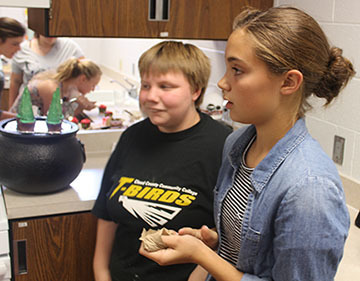 In the “Cupcake War”, students were divided into teams with an objective of baking the best cupcake. The teams were, “Two Smart Cookies” (Emma Yungeberg & Mackenzie Brown), “Salem Witch Sisters” (Catherine Toerber & Destiney McLeod), “Ice Cream Sundayz” (Maddy Vermetten, Trenton L’Ecuyer & Paige Woodyard), and the “Jolly Jingles” (Kyra Breasseale & Yarsharia Cooney). All cupcakes were made from scratch with homemade frosting. 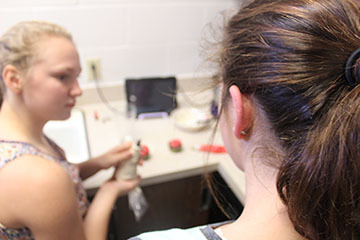 Competitors were given three days of class to make their cupcakes. On the final day of the competition, Friday, the winning team was decided. “Two Smart Cookies” won. 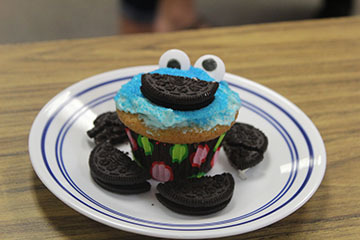 The cupcakes were made with vanilla batter, with an oreo in the center, blue frosting, and then topped off with blue sprinkles, an oreo, and candy eyeballs to resemble the Cookie Monster! A job well done by the “Two Smart Cookies”.